According to Kovalev’s promoter Kathy Duva, Sergey’s next fight would take place sometime this coming November. Despite the fact that team Kovalev has recently filed for protest to his rematch against team Ward, due to the supposed low blows that forced the outcome of the fight, the investigation and decision that will be made by the Nevada State Athletic Commission will unlikely result in a mandatory third fight. So what’s next? Who will Kovalev see in the ring as his next rival? At this time there is no information of any sort. While Kovalev certainly knows his body best, moving to the heavyweight division he may be facing fighters well above his comfortable weight. While I do believe that Kovalev could perform just as good at slightly higher weight, it is unlikely that he would be able to tolerate the power that natural heavyweights bring with them into the ring. John David Jackson has been Sergey Kovalev’s boxing coach for some time now. Their partnership has delivered the Krusher into the upper leagues of professional boxing, and shaped Kovalev into the champion that he came to be. With all that being said, it seems as though Kovalev has noticed that he may have hit a wall, and in order to advance his boxing skills and move his career along, he may need a new trainer. That trainer could potentially be the same person who has chiseled Andre Ward into a boxing virtuoso that we see today; Virgil Hunter. “Wards trainer offered me to work with him, and this is an interesting offer. I asked my manager to find out how authentic his offer is, and what would the terms be. Will Ward stay in his current weight category? I heard that he wants to go up in weight. If him and I have the same trainer, and we stay in the same weight category, than this makes no sense. 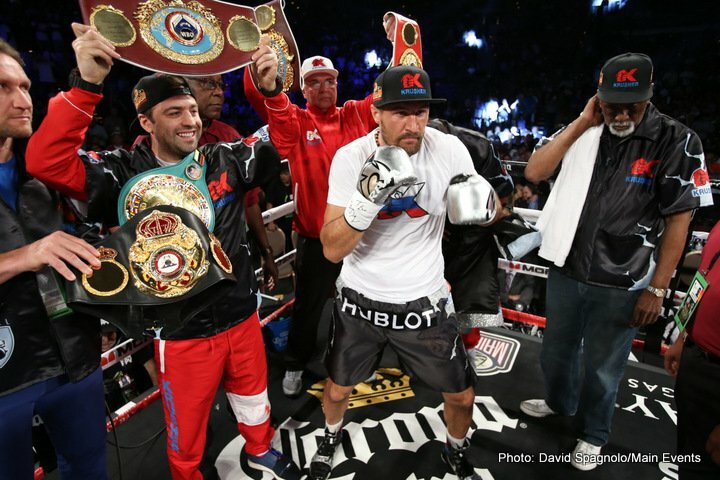 But the fact that I need a new trainer, this I have already decided,” stated Kovalev. Hearing that Kovalev is to some degree ready to move forward is a breath of fresh air. If he can indeed work with someone like Virgil Hunter, Kovalev’s future may turn out to be much brighter than it may seem at this point in time. “I need a new specialist, because I have made it to this point with all I know. In order for me to jump to the next level, and become better than Ward, I need help of a professional. Moving forward all by myself is now a tough challenge,” added Kovalev.